Adam Wormann started us off last Monday and Tim Schmoyer followed with his post on Tuesday. Jonathan McKee chimed in yesterday and now it’s Mark Riddle’s input to this question. Tony Myles wraps it up tomorrow. I have an affinity for youth pastors who hope for students to integrate the Bible into their lives. I suppose this is because I’m a fan of youth workers, a fan of God, and a fan of students and see the profound ways God transforms us all through the scripture. Of course, the trick with a question like this is in our hidden assumptions. Mine, as the reader, and yours, as the person with the question. Let’s look for an answer together as we unpack a few of these assumptions. 1. You can’t make someone read their Bible. This seems obvious, but it’s helpful to say. 2. You might be able to “get” someone to read their own Bible, but “getting” someone to read their Bible, but that’s not really the point is it? If I put you in a situation where you are reading the Bible it is probably a notch below making someone read their Bible. 3. The reason both 1 and 2 are difficult and borderline manipulative is that we’re working your agenda here, not the students. In fact, I can’t see anything representing the students agenda in this question, aside from the assumption that students don’t read their own Bible, or that there may be some kind of speed-reading community that is problematic for your context. I guess I’m saying, you “getting” a kid to read his/her Bible can be a good motivation, but isn’t always redemptive for the kid you’re trying to… ahem… get to read their Bible. 5. It’s not your responsibility. 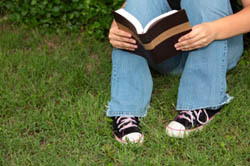 You are not responsible to God on whether or not the teens in your ministry read their Bibles. Maybe it would be good to reread that last sentence. If you agree with it, do you act like it? If you disagree, see points #1, #2, and #3. You aren’t responsible for teens faith in Jesus. If you feel like it is your job and that you are responsible for the faith or spiritual disciplines of teens then you’re with either wildly naive, co-dependent, or arrogant. Of course we all waiver between these three things but when we do it’s helpful to recognize that the students aren’t the problem at that point… we are. 6. Connected to #5, it’s not your problem. Solutions that last will come from the person who carry the responsibility for faith, not an outside source. You can impose solutions, give advice, and you can guilt a kid into having time alone reading their Bible, but if you feel like this is your problem to solve, it will always be your problem and not theirs. Give the problem back to the student. They’ll read their Bibles more often in the short run, but resent you (and maybe their faith) in the long run. 7. I feel like we’re getting closer to answering your question… let’s keep going. 8. A teenager reading a Bible is a relatively new thing in the history of the church. Shoot, a person reading a Bible is a new thing. Owning your own Bible (student or otherwise) is even more rare. In fact in the history of both the old and new testaments you’re looking at about 6,500 years of no personal scripture what-so-ever vs. 1,500 years (which is very generous) for even the technology to print a personal book for oneself. And if we’re talking about literacy, we’re hundreds of years, not thousands. I say this because sometimes it’s easy to think about personal Bible study as the cornerstone of faith and transformation when historically it’s never has been. This is not to say that Bible reading is unhelpful, only to say that we in the modern church get a bit worked up about kids who don’t read their Bibles. 9. Because of #8 scripture was not read by most people even in groups. Scripture was heard. Could it be that faith comes by hearing? Scripture is heard, together. Scripture was wrestled with, together. Scripture was lived out… together. Which leads to #10. 10. What does scripture say about reading scripture? The scripture never tells us to read the Bible by ourselves as individuals. (I guess this is obvious in light of #8). Scripture is always a communal event. Paul’s letters were written and read out lead to the whole church. Do you read the Bible together in your youth ministry? I assume a hardy yes or you wouldn’t be asking this kind of question. When you read it, are your students reading or listening? or both? Does scripture take center stage of your time together or does your talk? Where does the agenda of the other students (see #4) enter into transformation in your youth ministry? In what ways does your ministry attempt to live out scripture? Notice that I didn’t ask, “In what ways do you as the youth pastor attempt to have the ministry live out the scripture?” That questions misses the point. Scripture integrated into individuals in a youth ministry community comes from the work God is in the students. 11. If we aren’t making students read scripture and we are “getting” students to read scripture, then maybe an alternative is invitation. Invite students to read or listen with your group. Invite teens to explore kids to engage the scripture you read last week or the week before. Invitation gives power back to them for their faith. Invitation reminds you that manipulation isn’t the work of a pastor. Invitation honors the teen in ways they might not get in other areas of their life. 12. Invite kids into your community as you seek to be faithful to God together. Historically this may make a greater impact on the lives of teens than anything else you do. I hope this gets close to your question and maybe the questions others might have as well. QUESTION: How can we invite students to engage with scripture?